A magical place, Antelope Canyon. Hi all, as my first blog entry ever, I wanted to write about one of the most amazing places I’ve ever been. In Aug 2009, my buddies and I completed an adventure that we’d wanted to take ever since hearing about it several years before. One of our favorite “guy trip” destinations is Lake Powell in Southern Utah. I’ll post about some of those adventures later, rest assured. On this trip we decided to venture to the far southern end of the enormous lake from our entry at Bullfrog Marina. We’d never been that far south, but needed to for this trip because we had to be within easy reach of Wahweap Marina and the tour bus that would take us from there into Page, Arizona. 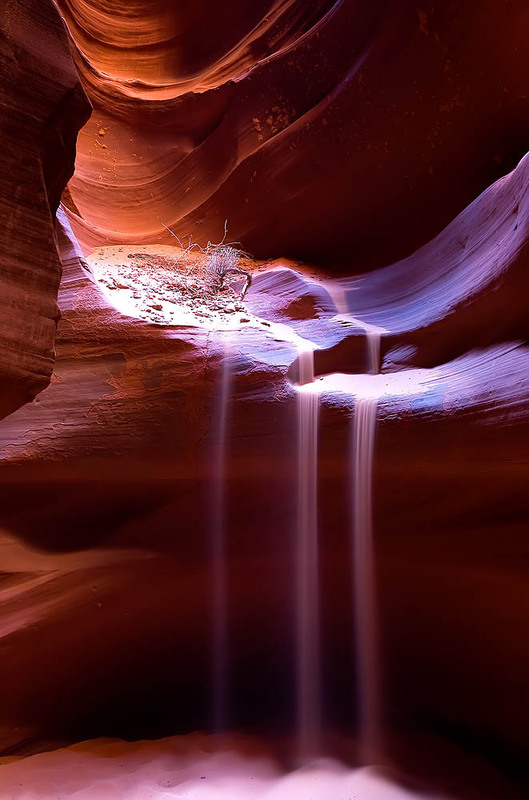 Antelope Canyon is located on Navajo land just outside of Page so to visit this amazing place you must take a tour from one of several companies located in this small town. 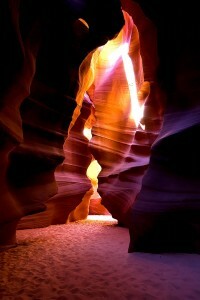 We used the Antelope Canyon Tours by Roger Ekis company and were happy with our choice. We paid a little extra for the Photography Tour and were very glad we did as the photography tour grants you more time in the slot canyon and also includes guide assistance as crowd control to get images that don’t include some of the many tourists that will be joining you in the canyon. Be prepared for a bit of a thrill ride as you travel from the tour headquarters out to the canyon. 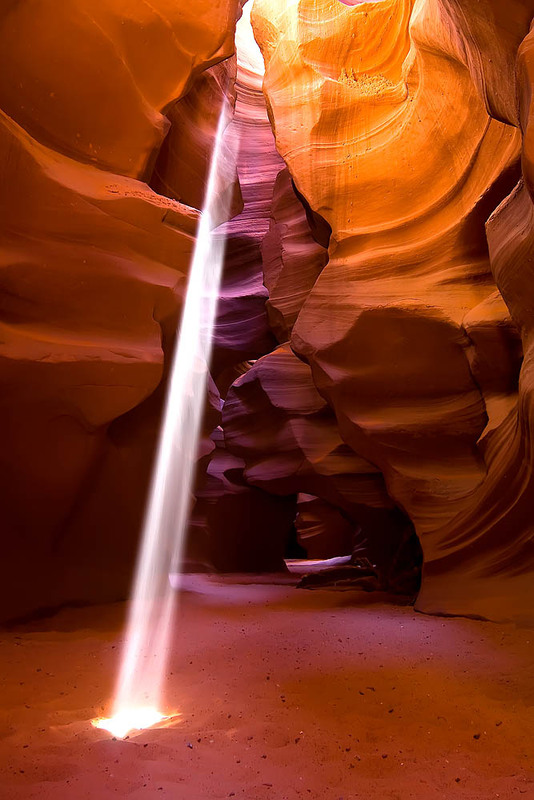 One of the most notable features of Antelope Canyon is the powder fine dust that’s created from the natural wear of the sandstone that forms the canyon. Think orange powdered sugar here. It gets everywhere (more about this later) and on the occassions when the canyon is flooded, a bunch of this sand flows out into the washway at the lower end. This riverbed is your driveway to the entrance of the canyon so the trucks that take you there are equipped with large tires and momentum must be maintained over the sand or they’ll bog down. So, hang on tight and keep your loose items secure. The entrance of the canyone is pretty unassuming. It looks like what you’d expect, a washed out riverbed with very high walls. It’s only when you get inside that the magic starts. The lightbeams that you see in the images are only visible on bright sunny days and then only as the sun passes directly overhead of the small gaps in the tops of the canyon. They are not viewable year-round either so check with your guide company to ensure the time is right before you finalize your plans. 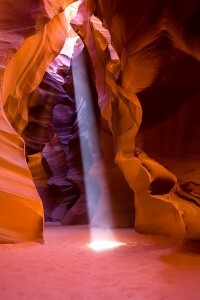 Your guide knows the schedule and when lightbeams occur in each “room” of the canyon so listen close. They’re only visible for 15 minutes or so and then vanish for the day. We were lucky enough to have ideal conditions on our visit and were thus able to see the beams in a variety of different areas. From my single experience, it seemed to me that there were two very different ways to view the canyon. One as a photographer and one as a tourist. I’m going to go out on a limb and guess that the tourist version results in many fewer sore muscles from crouching, kneeling and bending your body into unusual positions that are required to get the best shots. Believe me, my 44 year old body paid a dear price the following day! But it was entirely worth the pain :). For those considering a trip, the equipment I bought into the canyon included the following. Two Canon bodies, one with the Canon 10-22mm lens and one with the Canon 17-85mm lens. I used the 10-22mm almost exclusively. One very important note on the dust (I told you I’d come back to this). The only reason you can see the lightbeam is because there’s dust in the air for the light to reflect off of. Without the dust, no lightbeams. The downside on this is that it get *everywhere*. I covered my camera in a plastic rain shield that one of my friends loaned me (thanks Schreck!). but few others went this far to be sure. The one critical recommendation that I have though is do not change lenses in the canyon. You’ll almost certainly be sending your camera in for a factory cleaning if you do. 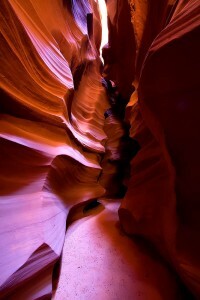 You might be surprised to find that Antelope Canyon is only about 1/4 of a mile long, I was. 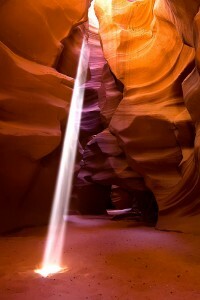 I think the tourist view of Antelope Canyon would be much different from the photographer view. As someone very excited about seeing what kind of images I could get from this beautiful place, I spent most of my time listening to the guide and then waiting my turn to crouch down to take my shot. The difficulty here is that every turn yields a different view and virtually every step creates a whole new environments to consider for including in your gallery. It’s very exciting but extremely stressfull. By the time our 2 hours was finished, I felt like I’d just finished a football game. Another amazing little jewel inside the cave, similar to the lightbeams, are the sandfalls. The sandfalls occur when the powder fine sand is blown from the top of the canyon. It’s so fine that as it falls it “flows” like water down the many ledges inside. While there are many places to see this, there are a few choice areas that your guide will direct you to as part of the tour. He or she will ensure that you’re able to take back this memory are part of your experience. The trick is making sure you’re ready to catch it when the there’s enough sand flowing to simulate these little waterfalls. Antelope Canyone is a huge pain-in-the-neck place to get to. There’s not much to do in Page other than this type of thing so you have to really want to be there. I hope these images demonstrate the splendor that is this canyon but for my $.02, it’s worth the cost and effort to get there yourself. Oh, and there is at least a golf course in Page so that gives you something to do between tours. 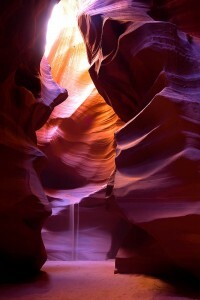 There are several other images of Antelope Canyon in the gallery. Don’t miss those as well.